Fat gets a bad rap, but it's essential to your health. 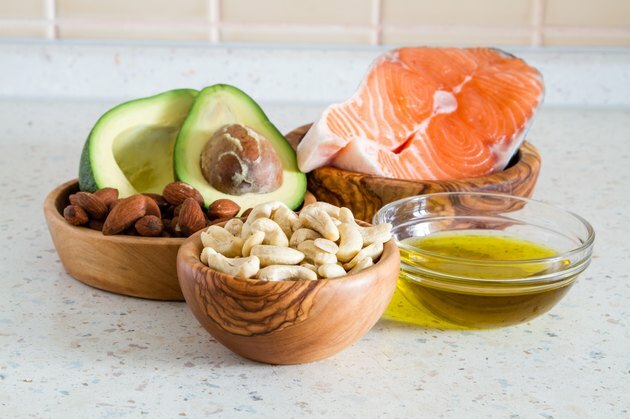 If your body isn't able to absorb fat from the food you eat, you're also not absorbing fat-soluble vitamins and other essential nutrients, which may lead to deficiencies and malnutrition. A few disorders are associated with problems with fat digestion and metabolism, including pancreatitis, cystic fibrosis and Zollinger-Ellison Syndrome. If you suspect you're not absorbing fat properly, consult your doctor. Fat digestion begins in the stomach, where the digestive enzyme lipase -- some in your saliva and some secreted in the stomach -- begins to break down the long chains of fat, known as triglycerides, into smaller pieces. The rest occurs in the small intestines, where additional lipase enzymes from the pancreas, along with bile, continue to break down the fat into monoglycerides so it can be absorbed. The monoglycerides facilitate the absorption and transportation of fat-soluble vitamins A, D, E and K, as well as phytochemicals, including lycopene and the carotenoids. In the body, the fat is used to maintain cell membranes and as a stored form of energy. If you're not digesting and absorbing the fat in the food you eat, your body will give you a few hints. One of the tell-tale signs of fat malabsorption is steatorrhea, which is fatty stool that is foul-smelling, pale and greasy. The malabsorption also causes gas and bloating and sometimes diarrhea, too. Even though you may have been losing weight, the change in bowel movements is usually what prompts a visit to the doctor. Cholestasis is a stop or slowdown in the flow of bile -- which is a substance that helps your body digest fat -- from the liver to the small intestines caused by an obstruction, such as gallstones, or an impairment, such as inflammation from liver disease. Because the bile isn't able to get to the small intestines, it can't assist in the digestion of fat, leading to malabsorption. The lack of bile also affects the absorption of calcium, vitamin D and vitamin K. If left untreated, it may affect bone health and increase risk of bleeding. Treatment of cholestasis depends on the cause and may include surgery or medication. Calcium and vitamin D supplements may also be given, but they aren't effective at preventing bone loss, according to the Merck Manual. Pancreatitis, which is an inflammation of the pancreas, is a common cause of fat malabsorption. Pancreatitis may be caused by gallstones that irritate the pancreas leading to an acute inflammation of the large gland, but the fat malabsorption usually occurs in chronic pancreatitis, which may have a number of causes, including a genetic predisposition, heavy use of alcohol or high levels of fat in the blood. The chronic inflammation makes it difficult for the pancreas to secrete enough lipase to digest fat, leading to the malabsorption. Treatment requires supplementation with pancreatitic enzymes and a low-fat diet. Cystic fibrosis is a genetic disorder that affects the epithelial cells -- the cells that line the passageways inside the lungs, digestive system, liver and pancreas -- causing them to create a mucous so thick and sticky the body can't dispel it. In the pancreas, the thick mucous prevents the secretion of digestive enzymes into the intestines, leading to malabsorption of nutrients, especially fat. Like chronic pancreatitis, treatment for cystic fibrosis malabsorption includes digestive enzymes. However, because this is a disease that affects children, a high-calorie, high-fat diet is prescribed to help ensure calories needs are met for growth, along with vitamin and mineral supplements. Zollinger-Ellison Syndrome is a rare condition characterized by the formation of tumors in the duodenum -- the first part of the small intestines -- and pancreas that release high amounts of gastrin, which is hormone that stimulates the stomach to release more acid. The high acidity causes ulcers to form in the duodenum and also obstructs the action of lipase, causing poor fat digestion. Treatment usually involves medication to decrease the acidity and surgery to remove the tumors. Diet doesn't affect the development or treatment of the condition, according to the National Institute of Diabetes and Digestive and Kidney Diseases. What Helps Absorb Vitamin D? What Are the Effects of Alcohol on Vitamins & Minerals?